Solar power is energy that is derived from sunlight and that has been used since the beginning of mankind. Unlike traditional fossil fuels (coal, petroleum and natural gas), solar energy is renewable and abundant. Additionally, fossil fuels are also known to give off polluting emissions that damage our environment whereas solar power is natural, clean and eco-friendly. With solar power being an effective, eco-friendly and economical form of energy, more individuals and businesses are choosing to install commercial and residential solar power systems, which are comprised of solar panels. Solar panels are essentially devices that covert energy from sunlight into electricity or thermal energy. All solar panels are comprised of photovoltaic cells that enable the renewable use of energy from the sun. Photovoltaic (PV) solar panels collect the sun’s energy and then provide electricity for commercial spaces or residences. Solar panels come in two varieties: Crystalline Silicon solar panels and Amorphous Silicon solar panels. Crystalline Silicon solar panels have a tendency to overheat, which is why many choose to use Amorphous Silicon, which is known to offer astounding energy efficiency. Installing solar panels can be quite challenging as people must create solar energy systems that provide optimal power transfer. For this reason, many people choose to work with a qualified solar panel installer, like Avatar Solar. For well over 10 years, Avatar Solar has been offering solar panel installation services to clients located throughout the state of California. We firmly believe that when people choose to use renewable energy, like solar power, they are making a decision that will save them money and help the environment. As an experienced solar panel installer, we have the dependable services you need to add solar panels to your commercial property. 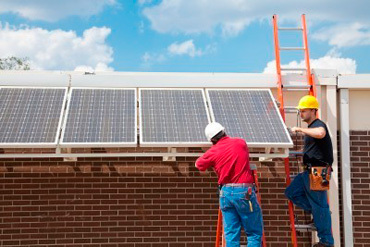 If you are worried about the cost of solar panel installation, we offer financing that can help you go solar affordably. Click Here Additionally, by utilizing alternative energy, you will be able to take advantage of several tax incentives, rebates and deductions – making now the perfect time to install solar panels. With our reliable services, clients receive great return on investment by using natural power from the sun. Set up an initial solar panel consultation for your mid-to-large scale commercial installation project.